One thing I would like it to do is start today and end tomorrow. As an example, if I set it to start at 2200 and end at 1600, it does not start. As is, I can only get it to run if the start time is before the end time. Great product by the way!! Please look at the above... I using ur program! any MyBot logs? My program is using MyBot's launching parameters to disabled running bot limit. 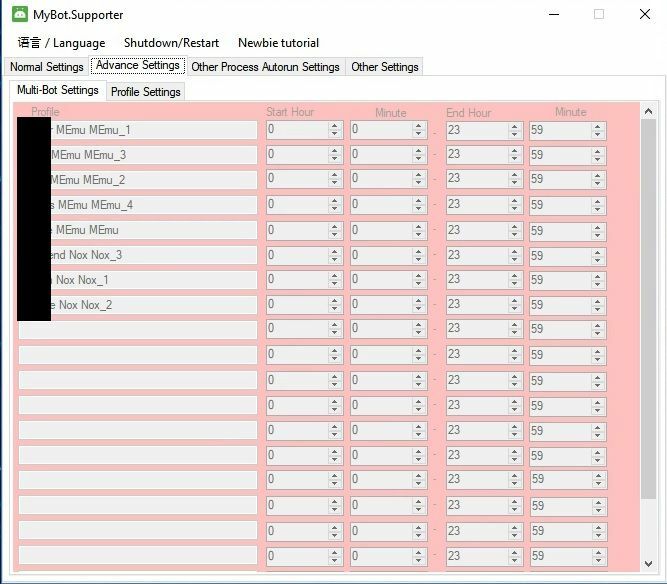 Anyway I also need your MyBot.Supporter profile settings as well. MyBot.Supporter is now open source! Welcome to view all the source codes! You can now create a MODed MyBot easily by ticking some ticks! Special thanks to (This is a people's name)@执着等待 for providing this MOD source codes!! Reduced file size for about 3MB! Now the supporter is as LTE as always! Waiting for more MODs added into here!